This is an update from a post from June last year, but I think deserves a new one, such is the outrage of this case. Observe this lovely riverside image in Brentford, directly opposite Kew Gardens. It is the developer’s own picture of its redevelopment of the St George’s Chapel site, until relatively recently the home of the Musical Museum. Looks lovely, I’m sure you’ll agree. Look at the small white building with the red roof to the left. Let’s zoom in a bit. That building is – or was – the historic Sarah Trimmer’s School, dating from 1806. It is – or was – significant as the first and only remaining example of an industrial training school in this country, mainly for young women. Historically highly significant. Here is all that is left of it as of Sunday. Only the west and south facing walls remain. They almost certainly will not survive. 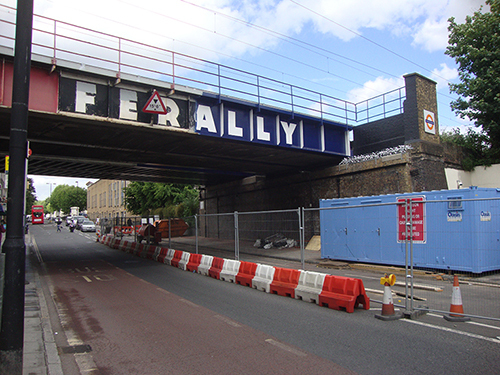 The developers – IDM Properties – have sneakily, deliberately and steadily destroyed the building while they got on with the chapel development next door. Why? Because they can maximise their take by building three teensy bungalow apartments against all advice of local historians and council denial of their planning application for same. 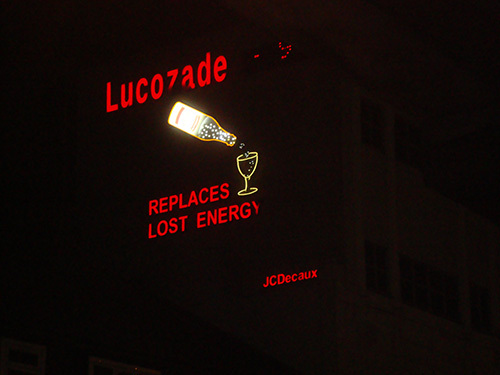 Hounslow Council gave them a bit of a slap on the wrist last year, but now seemingly have given up the candle. The developers are greedy scumbags (show me one that isn’t). The Council are cowardly and lazy collaborators. If they could wash their hands of the hassle of protecting our heritage, they would. I live in this borough. I am ashamed of them. I say again, delinquent developers must do jail time. I bet that’s in nobody’s manifesto! Firepower, the museum of artillery in Woolwich, closes its doors today for the last time. This is a tragedy. As a former gunner myself I am possibly biased, but in my opinion it was the best military museum in London with brilliant staff, brilliant volunteers and an outreach programme second-to-none. The museum’s archive has already been shipped out, leaving military history researchers in the lurch. Now the guns, ammunition, displays, ordnance equipment, medals collection (including 22 VCs from the 62 awarded to gunners) will be crated up, transported and stored at the Royal Artillery HQ in Larkhill, to be seen again when – who knows? I realise that there were – and are – challenging problems, mainly financial, relating to the museum, but I believe a better way forward could have been sought and found. Surely. The Regiment appears to have taken the easy way out and another strand of the thread connecting Woolwich with gunners has been severed. A “gunners gallery” is to be opened at the Greenwich Heritage Centre later this year apparently. Big deal. I understand from speaking to various people that the ultimate decision to close the museum came from the Master Gunner, General Granville-Chapman. Anyway, there you go. More heritage denied. I’ll pop into the museum for one last look today. I’d like to thanks all the staff and volunteers at Firepower for their enthusiasm and hospitality they’ve extended every time I’ve visited, an experience shared by many thousands down the years. Good luck with all future endeavours. Ubique! I was taking a stroll down to Brentford High Road yesterday and noticed that the old cop shop is for sale: it’s been closed for years. 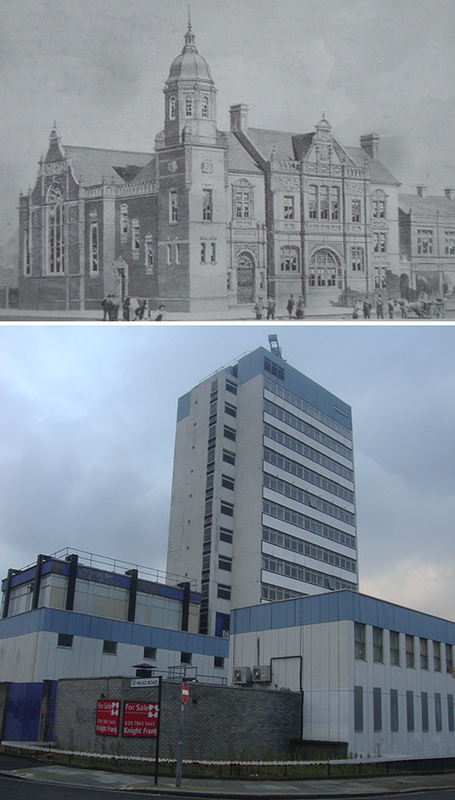 A typically charmless 60s commercial building, purpose-built for the boys in blue, it replaced the rather fetching Vestry Hall of 1900. The hall was designed by local architect Nowell Parr, many of whose pretty buildings (mainly Fullers pubs!) 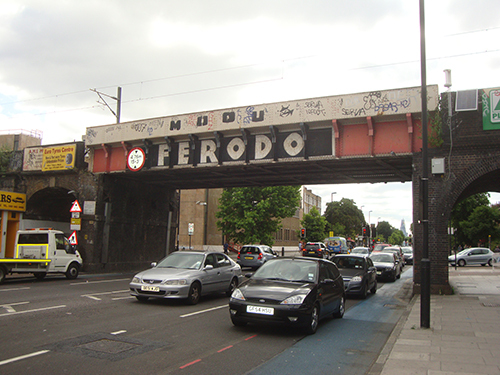 still decorate Brentford, Ealing and Chiswick. The old hall could host meetings and talks of over 600 attendees and also housed Brentford County Court. But in 1963, the bulldozers and wrecking-ball moved in. Progress! I hope to do more on Nowell Parr in the near future. Meantime, enquiries regarding the lovely police station should be directed to Messrs Frank Knight. Many were up in arms last week when English Heritage announced that, apart from existing commitments, it would be suspending its blue plaque activities. It was reluctantly taking this step, we learned, because of the severe cut in its grant from Westminster. It had “stood down” its advisory team, comprising Stephen Fry, Andrew Motion and Bonnie Greer (yes, I wondered too!). Much gnashing and wailing of teeth ensued in the press (kicked off by the Guardian, who got its sums completely wrong. Bless), and also on Twitter and Facebook. You’d have thought that all the EH blue plaques were to be torn off the very walls they adorned. I don’t think we should be overly concerned. Further comment superfluous. 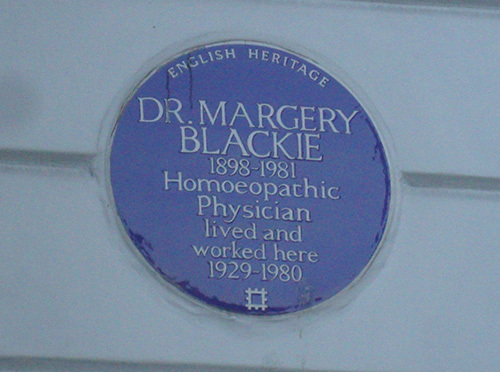 But in case you’re in thrall to the miracles of Homeopathy, it’s very near South Kensington tube station. Second, English Heritage don’t have a monopoly on memorial plaques. 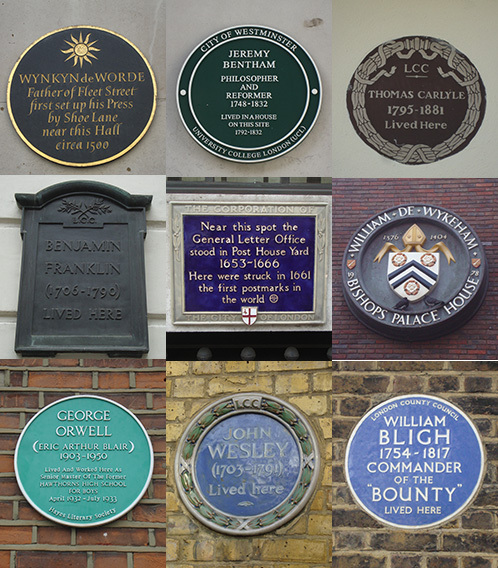 Just some of the organisations which have put up plaques over the years include London County Council, Greater London Council, Dead Comics Society, City of Westminster, Mayor of London, Hayes Literary Society, The Corporation of the City of London, National Art Collections Fund, Guy’s and St Thomas’ Charities Foundation, London Borough of Southwark, John and Ruth Howard Charitable Trust. And on and on. What’s more, attractive as the EH plaques are, some of the others are equally and indeed more so. And in a variety of shapes, colours, sizes. We need variety, and London does higgledy-piggledy rather well. I’m particularly fond of this world-weary item, provenance apparently unknown. Third, if we have to have new plaques, it doesn’t have to be English Heritage who takes care of matters. Its ugly sister, the National Trust, is apparently willing to step into the breach. Furthermore, subject to listing, ownership and possibly by-laws I’m not aware of, you can do your own plaques if you have a mind to. Just last summer, the Historic Kilburn Plaque Scheme, led by Ed Fordham (LH Member) put up a plaque to George Orwell. Finally, I’d like to point out that I’m a fan of English Heritage, in fact I’m a very recent joiner. They run their properties well and have delightful staff. I can see that George Osborne’s Big Cut will give them a nasty headache. But we don’t really need new English Heritage blue plaques particularly urgently one way or another in my view; I suspect they have used this suspension as much as a publicity stunt as anything, and rather successfully, so it would seem. We needn’t get our knickers in a twist.